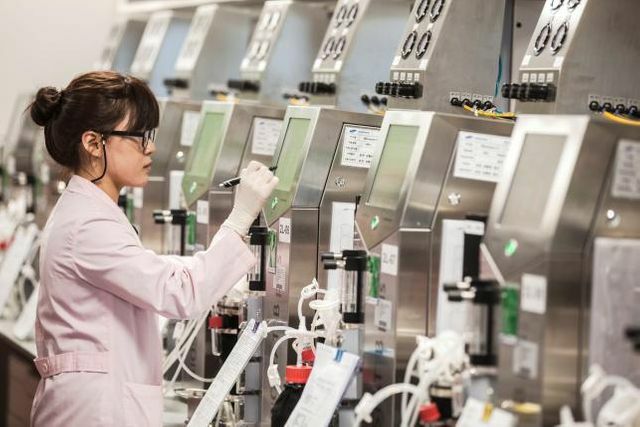 Samsung's biopharma company Bioepis is focused on speeding up biosimilar drug development - aiming to be first or second to market for all drugs. By scaling up to mass production ahead of clinical trials it can achieve market authorisation much quicker following regulatory approval. The company also hired in experts from Novartis and Eli Lilly and brought in hundreds of young recruits to run 1000s of experiments. But perhaps most illustrative of the aim of the company is the countdown clock that constantly reminds the scientists when the first production run will start - any failures could push this back by months or even years. To get its biosimilars to market ahead of rivals, Bioepis is speeding up processes it can control. It tasked 300 researchers to run 1,500 experiments to cut down on development time for its Enbrel copy, dedicating about 100 bioreactors to the effort. It's tough for rivals to match that scale as pure-play biosimilar makers tend to be smaller start-ups and "big pharma" tends to focus more on original drugs, analysts say.